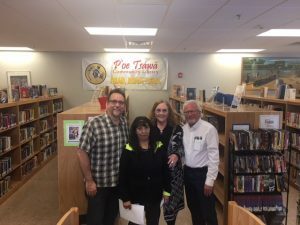 On April 12 & 13, Carson Block, from the Gigabit Librarian project visited Pueblo of San Felipe Community Library, Jemez Pueblo Community Library and P’oe Tsawa Community Library. Funded as a pilot under IMLS, this is an opportunity to educate rural and tribal libraries on their broadband infrastructure using a Toolkit developed under the project. Carson will make recommendations, long term and short term, for the libraries to improve their connectivity. It is an opportunity for the librarians to better understand their technology and to be able to communicate with IT on problems and improvements. 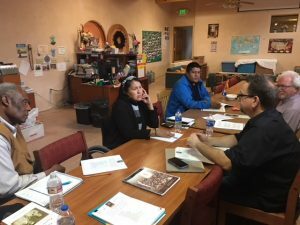 George Clarke from New Mexico Office of Information Technology joined Carson Block and Alana McGrattan, Tribal Libraries Program Coordinator to replicate the Toolkit in other locations.